I could see it was huge as it slurped down the floaters not six feet from the bank. A little bit further out were the pads, dense and thick, piled high on top of each other. The outer leaves jostled and quivered as the giant re-entered their cover, brushing against the stems. Now was my chance. A gentle underarm flick landed the free-lined double Chum hookbait mid-channel between the bank and the pads. Soon they plucked and jostled again... closer, closer, please keep coming... Suddenly there it was, breaking through into the channel, long and wide, and heading straight for my hookbait... Shaking hands, breath held, time frozen... slurp... wallop! Whilst time froze at the moment of the take, for those last few seconds it passed in a flash. I was stuck in thick silt up to my waist in water, sun in my eyes, monster carp wallowing about beneath the tip, but somehow, into the net it went. To me, at just 18 years of age, it was a huge, and I knew it had to be the lake’s biggest common, the one all the big boys fished for. It blew me away in the water, but the impact it had once I had it on the bank was way more lasting. Thirty pounds and two ounces, from an era when 30lb commons were the fish to be dreaming of. Twenty eight years later, the buzz lives on. The year was 1990 and I was living the dream of lots of fishing thanks to the Thatcherite inflation policy that put most of the building developers in the south east out of business over a period of six months. This inevitably had the knock on effect on a trainee QS being ‘last in and first out’. Much to my mum’s disgust I spent the whole close season feeding the residents of a small, deep gravel pit in Shepperton a couple of mixes of mid-protein milk/nut mix bait every day – normally wandering around until I found the better fish and getting them to eat each and every boilie on the drop as flattened boilies were flicked just in front of the fish. It was a delicious bait and, over the years, I had honed and tweaked the attractors and dry ingredients so it was confidence in a bag – a combination of Geoff Kemp’s Creamy Toffee, Nutrabaits’ Sweet Cajouser, Hutchies’ Cream Appetite Stimulator powder and a dash of Sense Appeal meant it worked wherever it was applied properly. My old mate Swinnie was also visiting the lake a lot too and he was feeding them his bait – a lovely Choccy Malt bird food (not dissimilar to Tenchy’s bait) as an uncooked paste, simply ripping small nuggets off the ball – and I soon twigged that this was far less labour intensive and would still work in terms of getting them to be fully confident and focused whilst feeding on the dreamy nut mix. The fish were growing day by day and week by week and, in the end all of the fish were prospering, growing chubbier on the ample free food that seemed to follow them about! Tet’s Pet was the biggest and greediest of them all, and consequently it stacked on the weight – plumping up beautifully from mid-20s into a good 30 pounder. She was a fish that had migrated from a lake a few miles away and was the focus of most anglers on the lake; but there were other lovely prizes: The Peach, The Beast and the Big Common amongst a total stock of about 30-40 fish. The little lake really was a hotbed amongst my peers as the lake offered challenging angling. I’d already lost it a couple of times and was quite gutted but I was utterly determined to make The Pet mine and kept feeding it wherever I could find it and setting traps nearby. It loved the bait – and it was really one of those wonderful scenarios when the bait was absolutely on full song. They absolutely loved it and as long as I kept it going in, it was inevitable that I would work my way through most of the carp stock. I probably lost The Pet another couple of times as the lake really was a nightmare – and I was learning and adjusting my tackle accordingly, as you’d get one thing ‘indestructible’ only for another item to fail under the immense pressure of snags, pads and deep water. First it was the hooks, then it was the hooklinks, then it was the mainline! Then when you went through and stepped everything up another level you reached the performance limit of one of the key items in relation to the others and you’d necessarily search for a stronger, better version of that component all over again. In the end the ‘ever reliable’ Sylcast was binned in favour of 15lb Big Game, and this was combined with new fangled 25lb Silkworm and little shrimp-pattern Owner eyed hooks; all making for a very robust setup that paired well with my trusty 2½lb Armalites. However, losses were still inevitable (though reduced), as some of the stands of pads were in 14ft of water and you’d hook fish at the base of them and they’d swing up on a locked-up tight line and be in the pads near the surface with horrific ease – but it was part of an ongoing learning curve and also mega exciting. I can safely say we loved it on there! In the end I nailed the great fish casting across to the pads from the Lawn and it was a case of get a bite (locked up) and immediately pick the rod up and walk back until you were crossing the little lane that separated the lake from the marina next door. Even though I did this the fish topped right on the extremities of the pads, which just shows that with line angles and stretch they have a lot more line to play with than you often anticipate! I was elated and look back at my time on that lovely, picturesque little lake with absolute joy. What an experience, what a great time, surrounded by like-minded carp angling friends and enjoying absolutely lovely times. When I look back now, they were halcyon days in the truest sense of the word. That might sound like my fishing these days is jaded or perhaps lacking something – it most certainly isn’t, I love it more than ever. The difference is that nowadays my angling tends to be very intense and focused, chasing tricky fish from testing waters. Back in the early 90s, it was different on many levels. Firstly, we didn’t try to catch a particular fish, we simply tried to catch a ‘a fish’ and secondly, most importantly, we would drench that pursuit in two key ingredients: laughter and lager. Fishing as a close knit band of would-be fishing heroes: Paul, Mark and myself would spend every single weekend on the banks of the Broxbourne Lagoons. It intrigues me to reflect on how the passage of time has increased in tempo – there is no doubt that as you get older, time marches ever more quickly. Now we fish all year long and often quite intensively, from April to November, yet back then there was a close season, meaning that we didn’t start until the 16th June. Despite this late start, those summer days seemed to last forever, much like school holidays did as a kid. Collectively, we fished the South Lagoon, gravitating to a grassy area at the south-western end, adjacent to the caravan parks. We were less interested in fishing effectively by being mobile, than we were with catching them on our own terms when the winds brought them to us. We’d set up our brollies, pepper the swims with Quench boilies then pop up the ‘offy’ for as much Castlemaine as we could carry. Successively the summers were good; long periods of high pressure bringing light northerly and easterly winds which, rather fortuitously, blew directly into the area we had our traps set. Don’t get me wrong, to us, carp fishing was a very serious business, in fact we lived and breathed it throughout the working week. We would strain at the leash of reality until finally it snapped on a Friday afternoon, then we were off, racing up the motorway with the smell of beer, wet nets and barbie smoke in our nostrils. The fish in the Lagoon were known to be big. In fact such heroic luminaries as the Famous Five had fished there, along with Zen and Nashy. The biggest was a 30lb common, one that had appeared in a Mainline advert at a huge weight of 33lb. 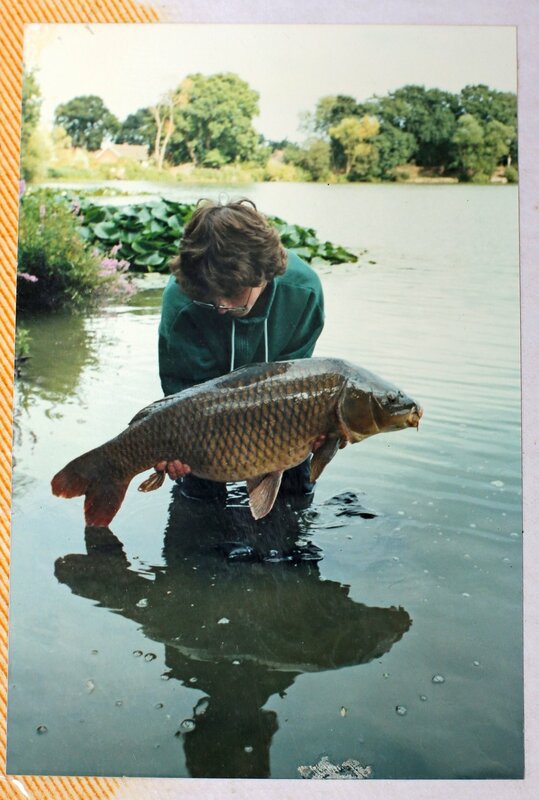 Believe me, back then that was a very big fish and possibly the biggest common in the general vicinity, aside from the gigantic Snake Pit fish just over the county line, in Essex. Mark came and woke me one misty, early July morning. Something monumental had befallen him and together we walked down to his swim, the dewy grass soaking our trainers. At the time, neither of us had caught a 30lb fish – carp of that size being reserved for the superstars of the period, and we certainly weren’t those. Mark heaved the fish onto the mat and as we peeled back the sack we were met by the most amazing, dark, immaculate common. We realised it was the big common and it weighed 30lb 4oz; the most incredible thing either of us had ever seen. The summer blurred on in a haze of sunburn, carp slime, kebabs and sore heads. Late August and I was back but rarely on this occasion, angling alone. Paul and Mark had fished the early part of the weekend but I had missed it due to a stag do and as I was best man, it was understandably hard to get out of. As soon as my duties were duly executed, I headed lake bound in the small hours of the Sunday morning, arriving exhausted and slinging the rods in the edge. I rebaited the rods, casting them toward the activity and can still vividly recall the tremendous drop I got as the rigs landed in shallow water on hard ground, atop a bar that ran parallel to the swim. I followed the rigs with some boilies, set the alarms and put the kettle on, all the while, glued to the water as I waited for another show. The bite came perhaps two hours later, the soft Daiwa taking on a savage bend as something serious surged off in the waves. And so began a fight of rather epic proportions, lasting maybe 25 minutes and one which, fortunately, I was allowed to be the victor of. The fish was none other than the coveted big common, the sight of which in my net, still gives me goosebumps today. At 31lb 4oz it beat my best by a couple of pounds, was my first thirty and proved to me two things: that we could catch them from big pits and that we could do it on our terms. Halcyon days indeed. When Bev asked me to write a piece for this special feature I was honoured, even though it was going to take time to recollect my first 30 as it was almost 30 years ago that I achieved this target. Oddly enough I’d caught my first 20 in 1980 and quite a few 20s came my way over the next five or six years, but some friends had joined Harefield Lake – aka The Madhouse because of some of the vicious gravel bars whose sole purpose seemed to be to cut you off. They asked me if I fancied joining them as it had a few 30s to go for – about half a dozen in about 45 acres – and was more challenging than some of our local Bedfordshire club waters. That year, 1986, I also met a chap that fished other lakes in The Colne Valley – on the banks of St. Cassien in the South of France of all places. His nickname was Keith the Tooth and we instantly started a friendship and when I told him I was going to join Harefield he said I’d need a bit of luck and that we’d probably bump into each other in the infamous Horse and Barge pub. Well I joined, and he was right, as Harefield wasn’t easy, but I did get lucky in the first couple of seasons with a number of 20s up to 28lb. I’ve got to admit I was still learning, but fishing amongst the ‘who’s who’ in the Valley I learned fast in every aspect of carp fishing. The lake was busy most of the time, midweek or weekends, and it didn’t matter when you rocked up to the lake there were always anglers there – though not so many in the winter as it had a reputation of being able to kick you in the nuts in the colder months. 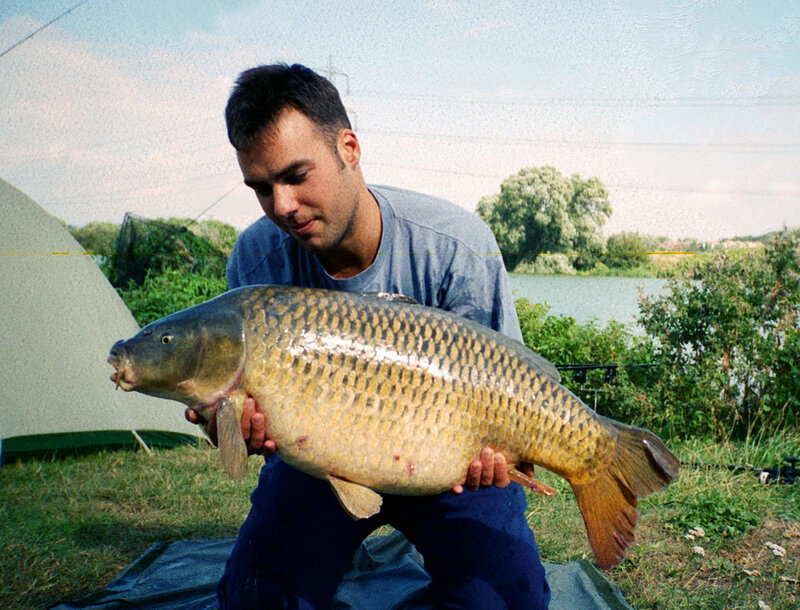 Anyway, in my third season I got lucky one weekend and had a five carp session from a swim known as The Mad – my best result up to that moment in time. One double, three 20s, and one of the biggest mirrors in there at the time – Tattoo at 34lb 4oz. Of course I was over the moon, not many anglers had caught this carp, so I was amongst a small group of members who’d had the pleasure. What just came into my mind is the bait which I was using was actually crap – well to me now it was – a cheap birdfood type bait and I’d roll one mix with geranium oil and the other with bergamot oil – and used the two baits together at the same time. They tasted disgusting, but obviously some carp liked it otherwise I’d wouldn’t have caught much. The following season I moved onto a much better, highly-digestible, fishmeal-type recipe, with a combination of Rod Hutchinson attractants and a dash of Solar’s Squid and Octopus. My word did this bait stink, but by heck was it a winner – not just for me but also for whoever I shared the knowledge with. We may think bait doesn’t make much of a difference to our angling, just like rigs, but I was soon catapulted into the limelight simply on my results. This was great as they were stocking more carp and the carp were packing the weight on. Amazing to think back now but within three or four years my results went from half a dozen over that magical 30lb mark to about 20. I went on to catch the three biggest carp, and then double up on them. The Big Fully-Scaled at 34lb and 36lb, Nelson at 36lb and 37lb 8oz and Small Pecs at 35lb and 39½lb. With a different bait and rig I soon began to catch a few in the colder months too, though most of these were from a small area at range and from one swim. Having cracked The Madhouse it was now time to move on, another ball breaker had come to my attention and the possibility of my first 40-pounder. Not only had I now sunk a few pints in the Horse and Barge – I’d met some very good anglers too, and so it’s only right I thank my friends Gary Bearman and Simon Day for suggesting I join them on some carpy adventures. My first 30 came a long time ago. More than 25 years ago now in fact, although if the truth be known I cannot remember the exact date. In the early 90s, fish of 30lb-plus were pretty rare creatures in the north-west. There were a handful all right, but getting on to the waters that held them was hard enough, then catching them as a young angler in a world of secrecy was an even bigger feat. To be fair I’ve never really targeted fish, and whilst I have a degree of admiration for those that do, my lifestyle, family/work life, and basic circumstances, never have, and for the foreseeable future probably still won’t, allow me to do this. Having said that, I reckon I’m probably in the same 75% category as most of the anglers reading this. Substitute a 30 from back then, to a UK upper-40 now, and you’ll see the task ahead. There simply were very few around me that I could get access to. 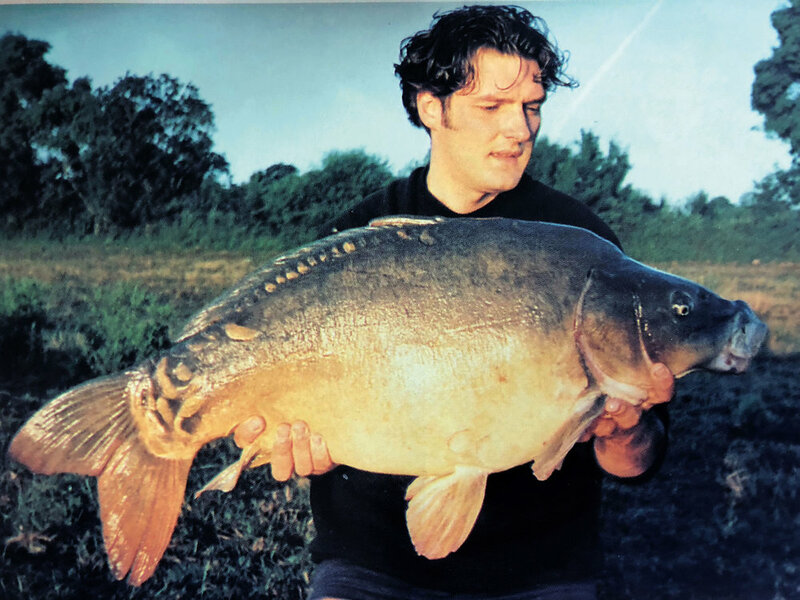 I’ve written about this before but it was a picture in the Angling Times of the great Rod Hutchinson at Cassien, with a massive carp on a red lilo, that first spurred me into fishing overseas. I think it was 1987 when he caught it and I vowed that as soon as I was old enough to drive I would head out to France to emulate my hero. A couple of years later with the world at my feet and a set of car keys and a passport in my clammy paws, I didn’t know where I was going, but I was. Back then Cassien was far too far for a young lad to drive to. I used to spend my time ‘blue spotting’ lakes in the north-west of France on maps and fishing in likely-looking places. I visited a few different lakes looking for the holy grail of a ‘30’ and eventually ended up on an unknown and virtually unfished stretch of river where there were plenty of rumours of some better fish but very little by way of proof. Back then, a 40-pounder was pretty rare outside of Cassien and a 30lb carp was still a big fish. There were certainly carp in this stretch and, although I’d filled my boots a few times, the bigger fish were much harder to come by. Night fishing wasn’t permitted so it was a little ‘cat and mouse’ driving down tracks out of sight and parking in towns and cycling to the fishing spot. Baiting up was a massive edge although if anyone ever found us fishing we would consider the spot compromised and would head out to a new spot. A few days of stealthy baiting up and fishing ‘under the radar’ in the dark were taking their toll. I was catching quite well and there were a good few 20s being landed but the 30 had so far eluded me. Remember that back then these 20s were still good fish and you can add at least 10lb on to that weight for a modern day equivalent. Half a dozen 30s in a night now would be a great result. I soon gauged that the bigger fish were coming from the right-hand rods so the effort was worth making. Four rods, two for action and two for ‘donkeys’ were spread across the river, and double bottom baits and stringers were the tactic for the bigger fish. It paid off, and after the usual hectic action from the smaller fish on the left-hand rods, one of the right-hand rods rattled off with a bigger fish aiming to go back upstream. After a very heavy scrap I landed a virgin, almost certainly ‘never been fished for let alone caught before’ mirror of 30lb-plus. Crazily, I can’t even remember the ounces now? It was a big fish and a great bit of adventure-pioneering back then. It set the scene for many future angling adventures and to catch a wild and unknown creature with no name as my first 30 was the icing on the cake.